Students are placed into teams to match each omnikin ball. 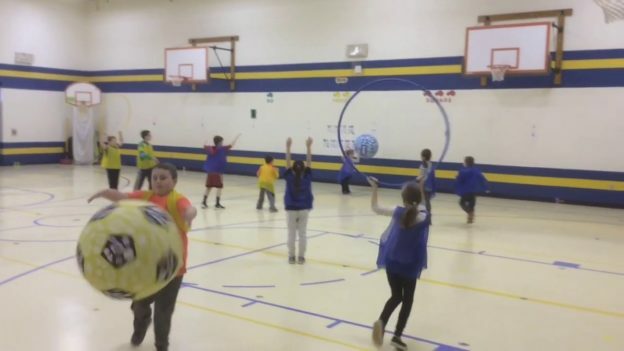 One player from each team must walk around the gym holding hula hoop above their head. The hoop is the basket for all the other teams. Students holding the hoop have to keep moving & can turn, duck, jump etc. to keep a team from scoring. While on offense, players can only take one step. Players must pass the ball in order to move closer to a hoop. Players may hit any ball as long as the ball is in the air to keep teams from scoring. A ball can pass through a hoop from the front or back to score. Switch players carrying hoop every couple minutes.